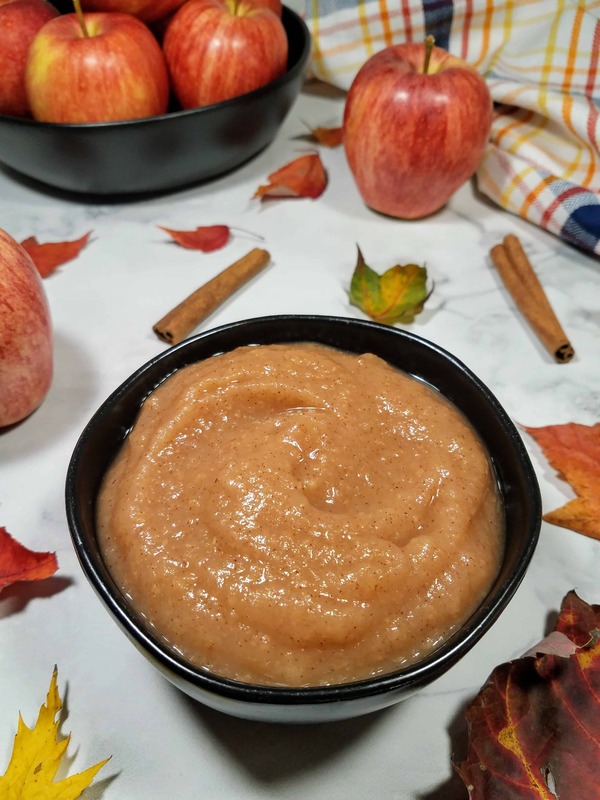 Healthy homemade applesauce is a staple in my household, especially when fall rolls around. I have somewhat of an apple buying addiction once they are in-season. 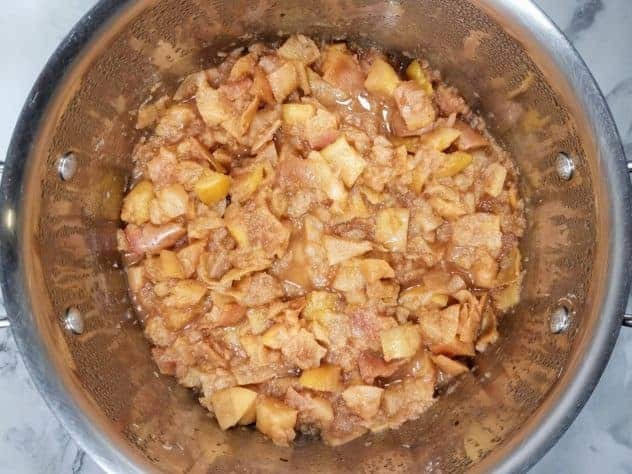 I love making a bunch of homemade applesauce at a time to freeze for later use, especially with cold and flu season coming up! And, I also like to eat it with my Thanksgiving meal. 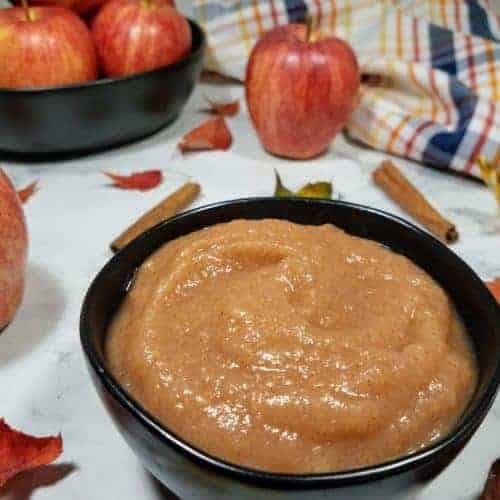 This healthy homemade applesauce recipe contains no added sugar at all. The only sugar in the dish comes from the apples. Then a nice blend of cinnamon, nutmeg, and cloves give it some warmth and spice. This recipe is easily customizable spice wise, so feel free to add/subtract spices. This recipe also makes use of an immersion blender because the apple skins are left on during the cooking process. After cooking them down, you just hit with the immersion blender for a few minutes and you have a nice, dark, hearty applesauce. How long does homemade applesauce last? Homemade applesauce will last 7-10 days in the refrigerator, or up to 2 months in the freezer. 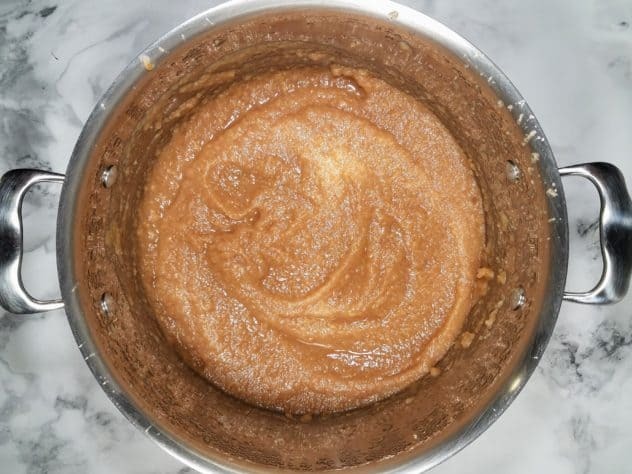 How do you make applesauce without sugar? Simple! You just core apples, add them to a deep pot with some water and spices. Stir everything together. Bring everything to a boil, then reduce down to a fast simmer for 30-40 minutes, or until the apples are soft and easy to mash with a spoon. Then blend with an immersion blender until desired consistency! If the applesauce is too thick for you liking, you can always add a little bit of water. Yes! As long as you haven’t added any sugar :). Applesauce is healthy, especially when you leave the skins on, because you get a good boost in fiber. Most people do not get enough fiber into their diets, and this is an easy way to accomplish that. Consuming fiber has numerous benefits, and you don’t want to miss out! What apples are the best for homemade applesauce? Personally, I like to use Gala or McIntosh apples for homemade applesauce. Because I generally only use up part of my apple bounty for applesauce, I usually go with Gala apples, because they are also good for eating plain (McIntosh are too tart for me!). But really, you can use any apples you want or even any combination of apples you want. 1. 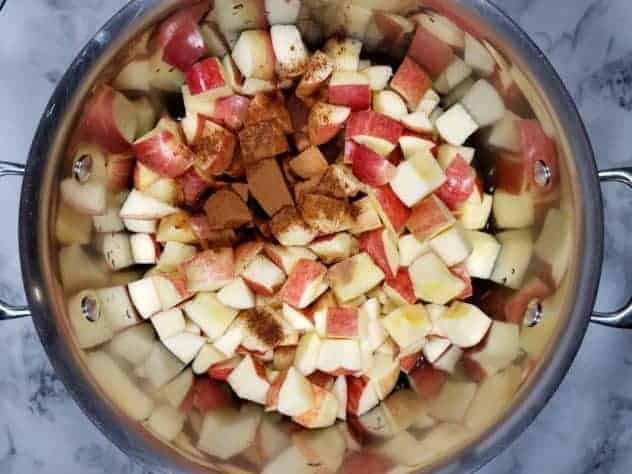 In a large pot with a lid, add apples, water, ground cinnamon, ground nutmeg, and ground cloves. Stir everything together until mixed. I know it looks like there isn’t a lot of water in there, given how many apples there are. But you will get a lot water from the apples as they cook down. You want to err on the side of having an applesauce that is too thick, versus too thin. The former can’t be fixed, whereas the latter can. As for the pot, be sure to choose a deep pot, especially if you are going to be blending everything together with an immersion blender. The immersion blenders tend to throw food everywhere, and you will want to contain it. Check out step 3 for what I mean ;). 2. Cover and bring to a boil over medium-high heat. Reduce heat to low-medium and cook for 20-30 minutes, or until apples are soft. Stir occasionally. 3. Remove pot from heat. Remove lid and allow applesauce to cool down so it’s no longer hot. Once it’s cooled, use an immersion blender to blend applesauce to a smooth consistency. Adjust taste with additional spices if desired. This healthy homemade applesauce is easy, delicious, healthy, and customizable! You can also make it in advance and freeze it, making it a great side for Thanksgiving! In a large pot with a lid, add apples, water, ground cinnamon, ground nutmeg, and ground cloves. Mix everything together. Cover and bring to a boil over medium-high heat. Reduce heat to low and simmer for 20 minutes, or until apples are soft. Stir occasionally. Remove pot from heat. Remove lid and allow applesauce to cool down so it's no longer hot. Once it's cooled, use an immersion blender to blend applesauce to a smooth consistency. Adjust taste with brown sugar or additional spices if desired. To freeze: Pour applesauce into a labeled freezer safe mason jar with a 1-1.5" head space and place into freezer for up to 2 months.